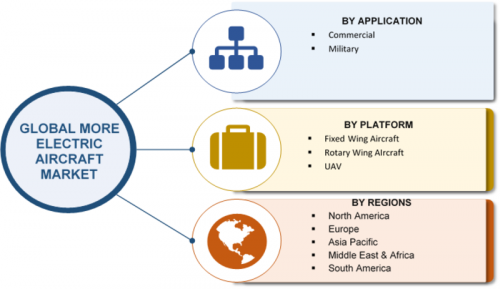 Global More Electric Aircraft Market Research Report Covers Historical Market Trends, Current Market Dynamics, Market Valuation by Segmentation as Well as Region, Country-level Analysis for Every Segment, Key Player's Market Share Analysis, Competitive Landscape and Supply Chain Analysis. More Electric Aircraft (MEA) are future-generation aircraft that are equipped with more electrical systems to minimize non-propulsive power systems, such as mechanical, hydraulic, and pneumatic systems. This has resulted in a reduction in the weight of the aircraft, usage of less fuel, and reduction in emissions, leading to a low cost of ownership and increased reliability. The replacement of mechanical and pneumatic systems with electrical systems results in a significant reduction in the cost of operating the aircraft. The absence of heavy machines that require constant repairs and maintenance to provide better efficiency, makes electrical systems a better option for both manufacturers and aircraft carriers. The global MEA market has drastically grown because of the increase in global air traffic and demand for new aircraft. The biggest challenge in the global MEA market is the need for huge amounts of electric power for systems, and with the current technologies in power electronics, it is difficult to achieve full efficiency. Moreover, there are technical issues with electrical generators in aircraft that need to be rectified. Another challenge in the market is the thermal management system, as electric systems generate a huge amount of heat, which needs to be utilized effectively or rejected into heat sink for the safe operation of the aircraft. Thermal management is a major issue in MEA. The amount of heat generated by electrically powered systems is enormous and needs to be efficiently managed. Excessive heat in systems will lead to system failures and with the absence of advanced technologies to manage the heat generated, thermal management has become a challenge for MEA. MEA lead to major acceptance and application from the military, due to its nature of silent electric engine operation. The military needs aircraft that can fly at low height and remain undetected during ISR, and therefore, MEA are vastly used for small electric aircraft and UAVs. Small electric aircraft and UAV are also used for militaries to guide their pilots in air-to-air combat. MEA brings in the collaboration of systems for control and intelligence of operating in-flight systems. The Environmental Protection Agency (EPA) had declared that jet engine exhaust risks public health to a larger extent by contributing to environmental change. The agency is looking forward to developing regulations, which are meant to minimize carbon emissions from commercial aircraft. It is observed that large commercial jets account for 12% of all emissions from the global transportation domain. Aircraft emissions are generally expected to rise by 50% by 2050, with the rise in the demand for air travel. The Clean Sky action launched in public-private partnership between the European Commission and the European aeronautics industry have declared plans to optimize the MEA performance to reach 20-30% of lesser fuel consumption and accordingly, CO2 emissions. Airbus and Boeing are two aircraft dealers using MEA, and Boeing’s B787 is the only aircraft in the MEA segment. It has successfully balanced fuel consumption and weight to deliver power equivalent to that of a fully ATF powered aircraft engine, although the range of flight is a bit less as compared to other aircraft in the same engine power segment. The cost of operation has gone down by few dollars per person per mile. The global more electric aircraft market is expected to grow at a CAGR of over 4%, during the forecast period of 2017-2023. JetSuite, US scheduled charter operator, will be the launch partner for Zunum Aero’s hybrid-electric regional aircraft. Zunum Aero is an aviation startup backed by Boeing and JetBlue. The delivery is scheduled to start from the beginning of 2022. In case of regional analysis of America, in 2013, there were 8,030 aircraft in service in America; 6,650 aircraft in North America; and the remaining 1,380 aircraft in Latin America. The region is expected to witness demand for 10,500 new aircraft over the next two decades. The growing demand for MEA has resulted in the emergence of advanced technologies in the field of aerospace, such as replacement of auxiliary power units with more efficient fuel cells to provide electricity on board. Another trend is the development of more electric engines pioneered by Rolls-Royce that will better support MEA. The increased usage of electrical components in aircraft is another trend in the market. Aircraft manufacturers, such as Boeing and Airbus, are investing in new electrical technologies to reduce costs and increase efficiency. This evolving trend in the presence of electrical systems in aircraft has led to the development of an all-electric aircraft. The global MEA market is highly competitive and vendors participate in variables of cost, reliability of product, quality, and customer service. To sustain and succeed in such a competitive environment, it is very important for vendors to provide cost-effective and high-quality MEA with the latest technology and materials.